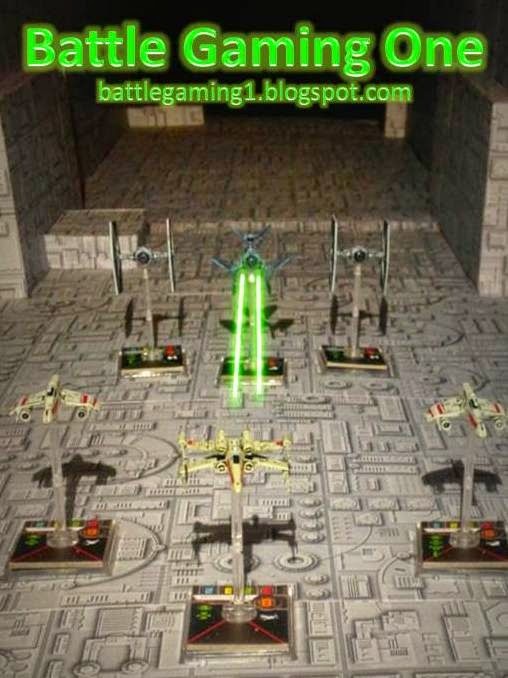 Battle Gaming One: X-wing: Death Star Trench! 2) Supported with pink foam beams and braces along the outside (found the pink foam for free as well). The pink foam turned out to work pretty well to hold things straight and square. Used hot glue to attach everything. Here's a link to the website where we bought the PDF of great Death Star graphics. 6) Then, stuck them down - and we were in business. Overall it's about six feet long. Not sure if anyone has any cool rules for playing Death Star Trench - going to think some up - and will write-up how our attempts go. Also - need step (7) - building some turbo-laser cannon turrets. Thinking to build them from pink foam as well. Also have some extra Death Star sticker sheets. Thinking to stick those on the back of our black 3 foot x 3 foot X-wing battle mat - in case we want a Death Star background instead of an outer space one. Here is one photo we took with some straight-ahead lighting. Had fun setting this up. Respect for the George Lucas team pretty high after trying all of this. Amazing what they were able to do.